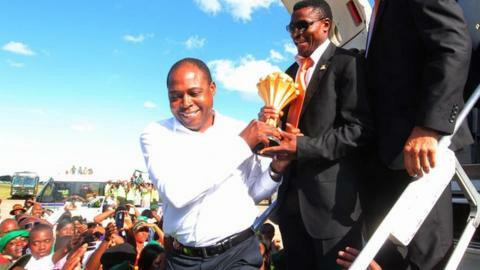 Uganda's football federation (Fufa) has turned to Zambian football legend Kalusha Bwalya for help in finding a new national coach for the Cranes. Bwalya, who was crowned African Footballer of the Year in 1988, will lead Fufa's five-man panel to select a coach to replace Serbian Milutin 'Micho' Sredojevic. Fufa stated that applications for the job will be open from 23-29 October prior to the new coach being unveiled on 15 November. "Bwalya is one unique football person in African and the world," said Fufa CEO Edgar Watson. "He has headed a Caf (Confederation of African Football) technical committee, is a legendary football player, has been a coach of a national team, has been a president of a federation - and he is neutral in terms of the Ugandan set-up." "He is everything in terms of technical experience." Bwalya, who guided Zambia's shock 2012 Africa Cup of Nations title as president of his country's FA, is also an Executive Committee member of African football's ruling body Caf. After becoming one of the first Africans to succeed in Europe, following successful spells with Cercle Brugge in Belgium and Dutch side PSV Eindhoven, Bwalya played in Mexico for several years before returning to manage Zambia between 2003-2006. Watson added that Bwalya will be supported on the panel by a member of the National Council of Sports, coach Stone Kyambadde, FA technical director Asuman Lubowa and the Fufa CEO himself. Earlier this year, Uganda played at the Africa Cup of Nations for the first time since the 1978 finals. However, the man who guided them there - Micho - left the role in August after Fufa failed to clear outstanding salary arrears of around US$50,000. Moses Basena has worked as interim coach since and led Uganda to January's Africa Nations Championship (CHAN). Micho's former assistant Basena also guided the team to a 1-0 win over Egypt, a 0-0 draw against Ghana and a 1-0 defeat in Egypt in 2018 World Cup qualifying. Uganda can no longer qualify for next year's tournament in Russia.